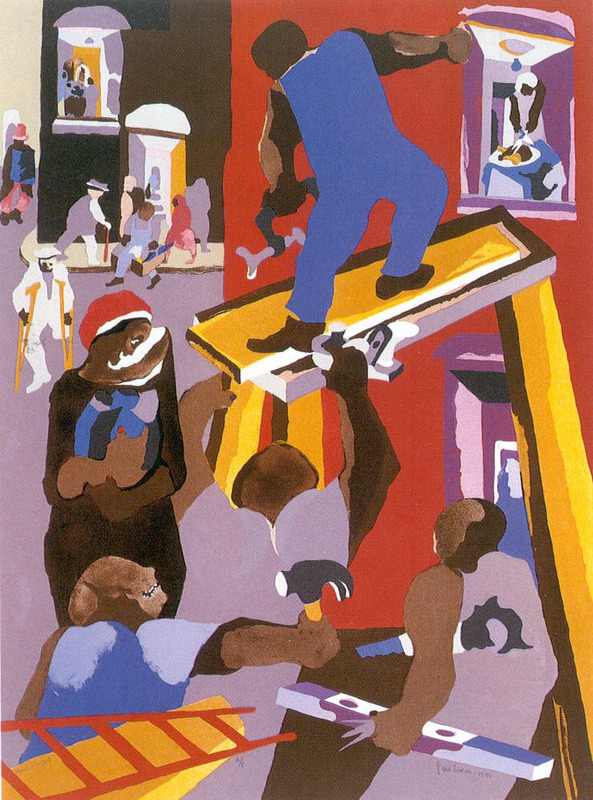 Born in Atlantic City, New Jersey in 1917, Jacob Lawrence emerged as one of America's leading figurative artists and the first to document the history of African Americans through widely-viewed and influential artworks. Lawrence and his family moved to Harlem in 1924, where he experienced the vibrancy of black intellectual, cultural, and artistic life in what was seen as the Harlem Renaissance. He became well known at the young age of 21 for his "Toussant L'Ouverture Series" (1937), a 41-painting collection that depicts the successful Haitian slave rebellion. At the age of 24, he became the first African American whose work was included in the permanent collection of the New York Museum of Modern Art. Lawrence considered himself both an artist and educator and used his art to tell stories about black history -- stories that were overlooked in the typical "American History" taught in schools. For example, Lawrence produced a 40-panel series on "The Life of Harriet Tubman" (1940), who in the 1800s helped hundreds of slaves find passage to freedom in the North through the Underground Railroad. His 60-painting "Migration Series" (1941) traces the mass movement of African Americans from the South to the North following World War I. These series use both images and detailed titles to create a narrative history of the event. 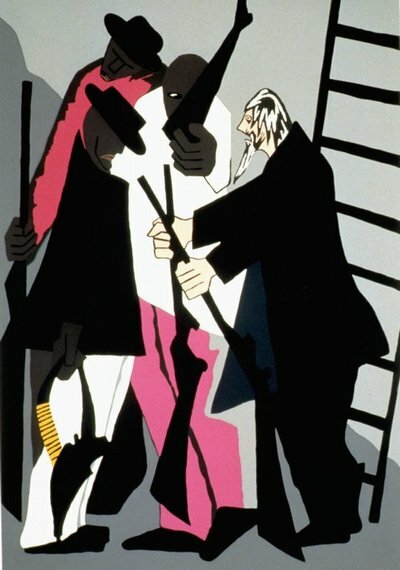 The 6th floor of the Allen Center exhibits a spectacular two-piece Jacob Lawrence print -- New York in Transit. Lawrence based this 1998 screen print on his design for the 36-foot-long mosaic mural of that name in the Times Square and 42nd Street Subway Station in New York City. Due to the strong 6th floor lighting that could harm the bright colors in the print, we obtained permission to create a 2x-scale photo reproduction, which is displayed outside of the Gates Commons. The original print is on loan to the Henry Art Gallery. Lawrence's 1985 lithograph, Man on a Scaffold, welcomes visitors to the CSE reception area. The Chair's conference room (CSE 110) houses a three-piece Lawrence etching, The Builder's Suite. Finally, we are extremely excited to have installed in the Allen Center the 22-piece Jacob Lawrence print series The Legend of John Brown, which is on loan from the Washington State Arts Commission. These prints depict the history of abolitionist John Brown, who prior to the civil war, sought to end slavery in the U.S. through an armed uprising. Caught in 1859, Brown was tried and hung for treason. 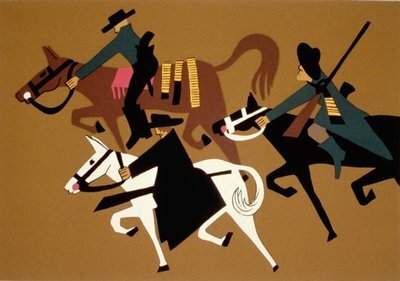 In 1941, Lawrence painted a series of twenty two gouache paintings depicting the John Brown history. 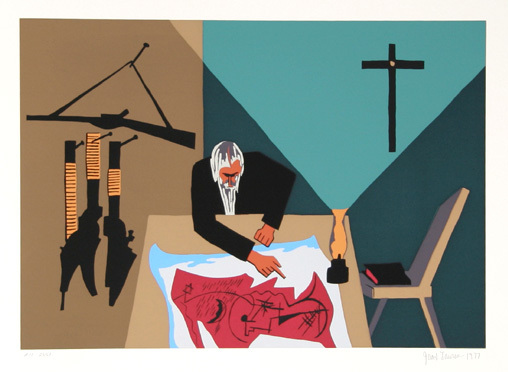 He produced print versions in 1977 when the original paintings, held by the Detroit Institute of Art, had become too fragile for display. The prints can be seen from the 2nd and 3rd floor bridges in the Microsoft Atrium of the Allen Center. Images and print © 2003 Gwendolyn Knight Lawrence / Artists Rights Society (ARS), New York. Photo of the Jacob Lawrence mosaic mural New York in Transit in the 42nd Street Station, New York. 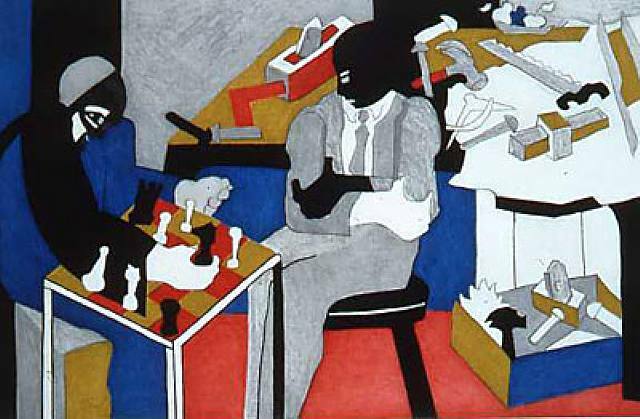 "Jacob Lawrence: Foremost Black Artist", article in University of Washington Alumni Magazine. 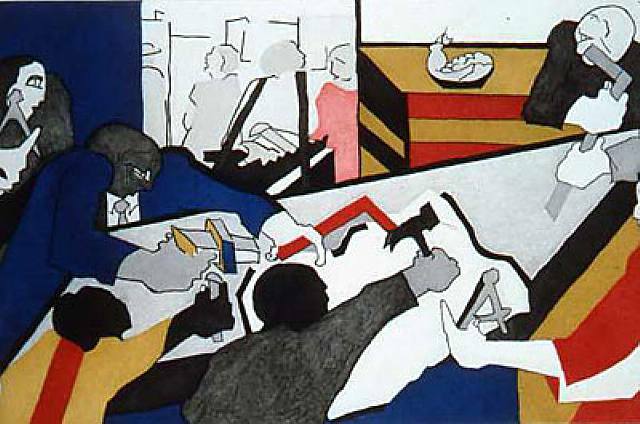 Jacob Lawrence: The Complete Prints (1963-2000), A Catalogue Raisonne, by Peter Nesbett. University of Washington Press, 2001. Over the Line: The Life and Art of Jacob Lawrence, by peter Nesbett and Michelle Dubois (Editors). University of Washington Press, 2002. 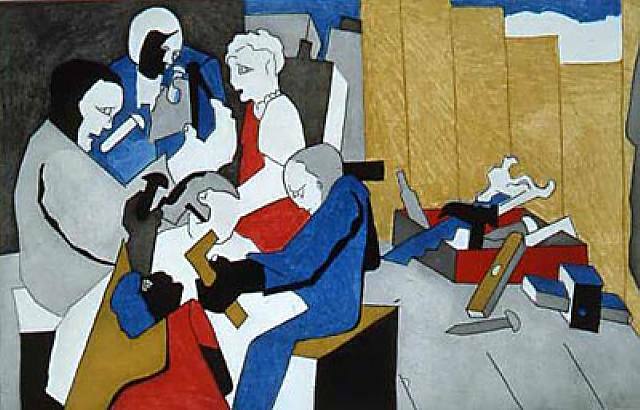 Jacob Lawrence: American Painter, by Ellen Harkins Wheat and Elle Wheat.